The Ottawa County golf community has a beautiful secret — Oak Harbor Golf Club. This scenic course, formerly known as the Portage Point Golf Club, is located in Oak Harbor, Ohio. It first debuted in 1964 with a breezy nine holes. Today, Oak Harbor Golf Club has evolved into 18 holes that plays from 5300 to 6500 yards, depending on the tees a player selects. Ottawa County golf veterans and rookies alike love the way this course can challenge and relax you all at once. The picturesque Portage River surrounds the course, making it both scenic and challenging. Our small greens have also earned an august reputation as some of the best within Ottawa County Public Golf. 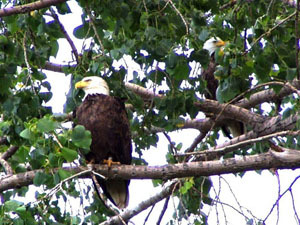 Our scenic course is visited by the many bald eagles that are native to our area, along with other various wildlife. But here at Oak Harbor Golf Club, we don’t just invest our energy in the course. No. In fact, we give players the best with our pro shop, driving range with natural grass tees and food and beverage services. We are also a great location for business meetings, receptions, and parties for all occassions. In addition, our PGA professionals are skilled in improving your game through lessons. We also have many exciting season pass opportunities to share with you. Stop by Oak Harbor Golf Club today, and enjoy the finest in Ottawa County golf. Oak Harbor Golf Club is near the Lakeside, Marblehead, Port Clinton & Fremont. Oak Harbor Golf Club is also near East Harbor and Maumee Bay State Parks. Copyright © 2019 Oak Harbor Golf Club All Rights Reserved.